Churchill Downs has set the dates for its quartet of three-day betting pools for its 2018 Kentucky Derby Future Wager ("KDFW") and a single pool for the historic track's Kentucky Oaks Future Wager ("KOFW"). Wagering on each of the Kentucky Derby Future Wager pools will open at noon (all times Eastern) of the first day (Thursday for pool 1, Friday for the remaining pools) and close on Saturday prior to post time of a designated race on the Road to the Kentucky Derby prep schedule, except for the first pool which will run from Thursday through Sunday. The KDFW Pools will feature both win and exacta wagering. The single three-day pool for the Kentucky Oaks Future Wager, now in its 14th year, is scheduled for March 9-11 and will run concurrent to Pool 3 of the Kentucky Derby Future Wager. Betting on the KOFW pool will open at noon on Friday and is set to conclude on Sunday prior to the post time of a designated Road to the Kentucky Oaks prep race. The 1eeth running of the $2 million-guaranteed Kentucky Derby Presented by Yum! Brands (G1), America's greatest race and the 1 1/4-mile first jewel of the coveted Triple Crown for 3-year-olds, is scheduled to be run on Saturday, May 4 at Churchill Downs. The $1 million-guaranteed Kentucky Oaks, the nation's top prize for 3-year-old fillies, will be run on Friday, May 4, the eve of the Derby. Like the Derby, the Kentucky Oaks has been contested annually since 1875 and its 2018 renewal will mark the 144th consecutive year that the 1 1/8-mile "Derby for Fillies" has been run beneath the track's historic Twin Spires. Wagering interests for the 2018 Kentucky Derby and Kentucky Oaks future pools will be announced on the Tuesday prior to the Thursday start of each pool. Real-time odds and other information on the KDFW will be available at the official event Web site at www.KentuckyDerby.com, and information on the KOFW will be available at www.KentuckyOaks.com. 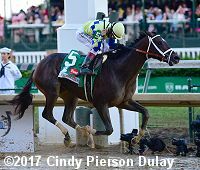 Always Dreaming's win in the 2017 Kentucky Derby paid $11.40 for a $2 wager on race day. In the Future Wager, his $2 win payouts were $4.40 in Pool 1 (field), $7.00 in Pool 2 (field), $86.40 in Pool 3, and $14.20 in Pool 4. Eventual Kentucky Oaks winner Abel Tasman returned $20.40 for a $2 win bet on the 2015 Kentucky Oaks, however her mutuel payout in the lone 2018 Kentucky Oaks Future Wager pool was $48.80. Full results for all four pools of the 2017 Kentucky Derby Future Wager can be viewed here and for the single 2016 Kentucky Oaks Future Wager pool here.